Discussion in 'Texas Flyway Forum' started by Whiskey & Me, Dec 11, 2007. For those that don't know Jim, he is a really nice guy and diserved to get such a trophy! When my mobile phone rang out about mid-day last Friday, I wondered who it might be that was calling around lunchtime. When I saw the name on the caller-ID, I didn?t have to wonder long what the call was about since one of my best pals, 61-year old Jim Lillis of Sherman, was hunting at Hagerman National Wildlife Refuge during the final segment of this fall?s archery hunts at the famed spot on Lake Texoma. When I answered the call, my suspicions were quickly confirmed. ?I just shot a monster,? an excited Lillis told me. ?How big?? I queried back. ?I don?t know, but he?s a huge 10-point,? Lillis replied back. ?He?s by far the biggest buck I?ve ever seen.? Fast forward to Hagerman NWR about an hour and a half later as refuge personnel, Lillis? son Jeff, and yours truly waited to see how big this buck was. With 10 lengthy points; solid mass; amazingly long main beams of more than 27 inches on both sides; an inside spread of 227&#8260;8 inches; a green gross score of 1812&#8260;8 inches; and a green net score of 1767&#8260;8 inches; the Lillis buck is a thing of beauty that few hunters have ever seen, much less tagged. If those numbers hold up when 60 day scoring is finalized, the Lillis buck stands poised to ****ter the current Grayson County record typical mark of 1654&#8260;8 inches, a buck taken by local hunter Ray Petree back in 2002. 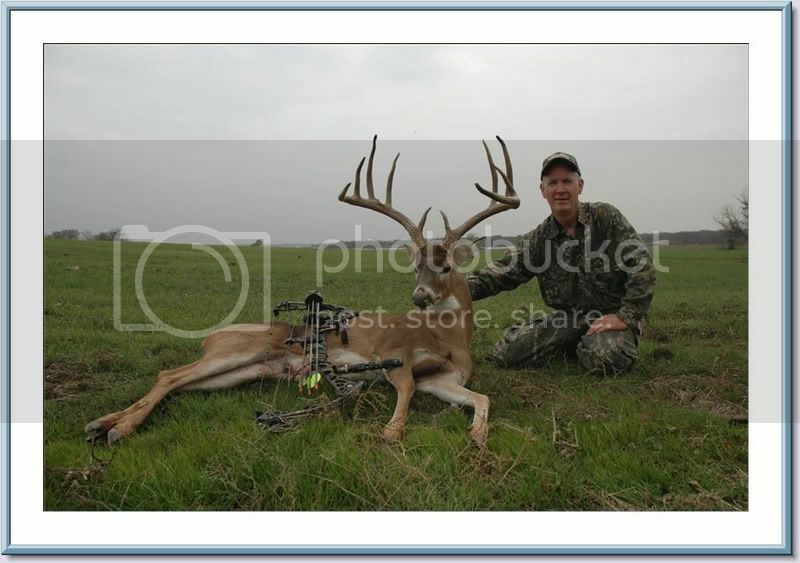 In fact, the Lillis buck could end up ranking as high as number two all-time in the Pope & Young Club?s listings for typical whitetails arrowed in Texas. Not bad, especially when you consider that Lillis was number 210 out of the 210 hunters drawn for this year?s Hagerman hunts. ?I was the last man drawn this year,? laughed the veteran bowhunter who has nearly 40 years of deer hunting and some 17 years of bowhunting under his belt. Lillis, a senior regional director for Ducks Unlimited, is no rookie at Hagerman, having hunted at the refuge on several other occasions. As he scouted the refuge out and compared notes with his son Jeff and his good friend Doug Rodgers, who both hunted at the refuge during the second segment, the elder Lillis became convinced that his favored areas from the past would likely prove to be good spots to try once again this year. ?I developed my game plan, went in before the hunt and did a little scouting, and all of the sign looked good,? Lillis said. After hanging his Lone Wolf Assault tree-stand in a funnel area during the set-up period, Lillis walked away as confident as one can be on a hunt where the best laid plans can quickly evaporate as 70 hunters invade the woods. The next day, Lillis had crawled into his stand before first light as quietly as he could. Armed with water, snacks, and a book, he was prepared to stay in his perch 18 feet above the ground until the curtain of darkness fell hours later. About 8:30 a.m., the local hunter saw his first action of the day as three does appeared. A little skittish, the female deer eventually turned and walked back out of the area. A short while later, Lillis spied a 3-point buck that came into about 25 yards in front of his stand. The third time that he saw deer on the move that morning was indeed the charm. ?About 9:30 a.m., I was sitting there and heard something gin the leaves right behind me,? Lillis said. ?I turned around and the buck I ended up shooting was about 50 yards behind me downwind.? Normally, that would be a problem, especially since Lillis tries to always have the wind in his favor. But when this buck appeared downwind of his position, Lillis attention to scent control paid off big. In addition to wearing Scent Blocker clothing, he showers before each hunt in scent-free soap; he washes his hunting clothing in scent-free soap and stores them in an air-tight container; he doesn?t dress in his hunting clothes until he is out of the truck and on his way to the stand; and he sprays down with Scent Shield spray. All of that scent elimination work apparently paid off as the buck came in nose to the ground and grunted once. During that time, Lillis quietly clipped his release on the string of his Mathew?s Drenalin bow, checked the rotation of his peep sight, made sure his Easton Axis arrow was on the rest, and eased into position. ?When he went behind a tree about 90 degrees to my left side, I came to full draw,? Lillis said. ?When he started moving again and came out into my shooting gap, he stopped; I put my sight pin right where I wanted it, and shot him at 18 yards.? That?s where Lillis attention to shooting practice paid off ? he practices throughout the summer and fall and had put three dozen arrows into a target the day before his Hagerman hunt began. Even though the buck had started to move again as the Muzzy 75-grain three-blade broadhead slammed home, the shot was a good one. After watching the buck bolt off, Lillis was a bit concerned that he might have hit the buck a bit too far back. As it turns out, the buck only traveled about 70 yards before going down thanks to the liver, artery, and back of a lung shot that Lillis had successfully executed. When I first talked to Lillis on the day of his historic feat, he seemed a bit shaken, almost in disbelief that he had just accomplished what most hunters can only dream of ? taking a Booner with a bow. ?I was pretty sure when I saw him that he would be a book deer ? I was hoping for a Pope & Young,? he said. ?But I had no idea that he would be a Boone & Crockett buck, not a clue.? It would have been cooler if he said: "I wasn't sure where to hunt so I posted up on the internet to ask a bunch of yahoos who I've never met what they thought my plan should be.? "Throw it, fine. But brother, if you're going to win, you're going to have to run the football." it may be gay but not that bad. Nice! Its always great to hear when someone who has given so much, get a little back in return. Tainted w/ what??? A beaver that drips honey?? I saw it on TBH. VERY impressive. If God doesn't burn California to the ground, then he owes Sodom and Gomorrah an apology. He killed it about a mile or so from where my roommate killed his. I've got the picture's in email, but don't know how to post them. Donnie's scored 211 and change green gross, 199 3/8 green net, 29 pt non-typical. REMEMBER IN NOVEMBER, VOTE THE BUMS OUT! Here is the pic of the monster!